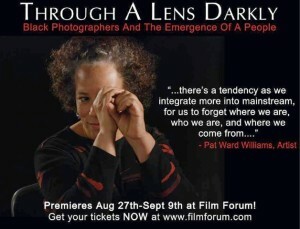 An interview with Florida State University Art Professor Pat Ward Williams is included in the new film Through A Lens Darkly:Black Photographers and the Emergence of A People. This 92 minute feature-film by Thomas Allen Harris made its theatrical premiere at Film Forum in NYC. It is scheduled for broadcast this fall on numerous PBS stations. As the first documentary that explores the American family through the eyes of black photographers, Through a Lens Darkly explores the recesses of American history to discover images that have been suppressed, forgotten and lost. The images explored in this documentary display a world that confronts the difficult aspects of society and citizenship and explores what exactly it means to be human. The film reveals deeply disturbing truths about race relations in America while simultaneously expressing joyous and life-affirming sentiments that are expressed through the photographic lens. Through a Lens Darkly is inspired by Deborah Willis’ book Reflections in Black and features works by Carrie Mae Weems, Lorna Simpson, Anthony Barboza and many others. Like the book, the film introduces the viewer to storytellers who transform the experiences into a journey of discovery with a call to action. The artists explore a wide range of images from Americana showing negative representations that yield a political force, even though they may be fictional. The documentary seeks to explore how photography was used in the two main portrayals in American History and how these portrayals shaped the country as we know it today.